ReNew Life - Digest More - 135 Vegetarian Capsules Renew Life Digestmore is an excellent, natural enzyme formula for daily use. Taking DigestMORE with meals is a smart step towards healthy digestion. 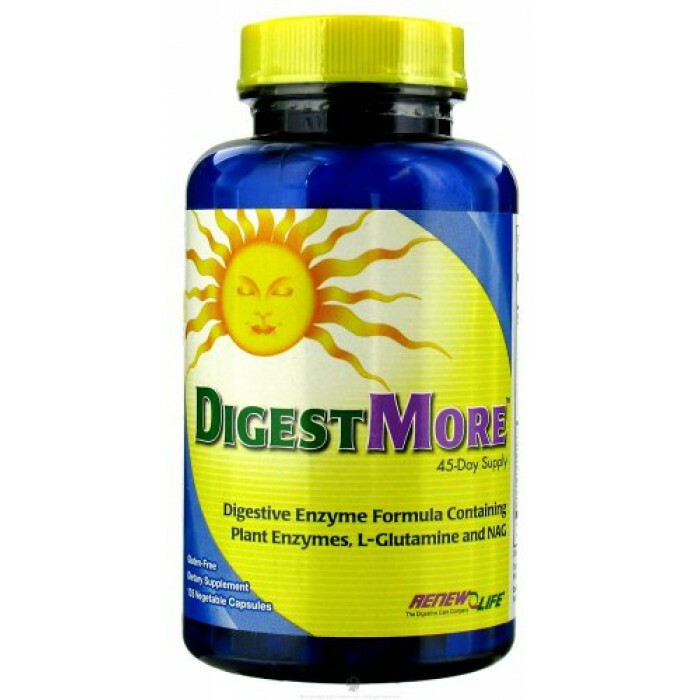 DigestMORE is a plant-based digestive enzyme supplement blended with herbs and nutraceuticals for additional digestive support particularly for those with 'sensitive stomachs'. DigestMORE contains 10 plant-based digestive enzymes,which help digest a variety of food material, including protein, starches, vegetable fiber, and dairy. * Additional herbal and nutraceutical ingredients include marshmallow, ginger, and gamma oryzanol (from rice bran). The amino acids L-glutamine and N-acetyl D-glucosamine provide nutrient support for the digestive system. * DigestMORE may be taken by anyone who wants to maximize the nutrients they obtain from their food, while promoting healthy digestive function. DigestMore Powerful Plant-Based Digestive Enzyme Formula with Enzymes, L-Glutamine & More to Support Digestive Tract Health* Digests Proteins, Carbs, Fats & Dairy Soothes & Nourishes the Digestive Tract Helps Prevent Occasional Gas, Bloating & Indigestion With SmartZYME TM Blend for More Complete Digestion No Binders or Fillers ReNew Life uses an exclusive SmartZYME blend of enzymes that represent multiple strains blended to increase the potency of the enzymes over a broader pH range. These enzymes are more broadly effective in the human digestive system.